In my 15 years of working at camps, I’ve learned a lot about packing camp luggage, and I wanted to share some tips. As part of Wildwood’s New Camper Orientation, I demonstrated how to pack luggage for camp so that it all fits neatly in containers that close securely, will be easy to transport, and can be neatly stored in a tent or cabin. Before I unpacked, I took pictures to share with you. 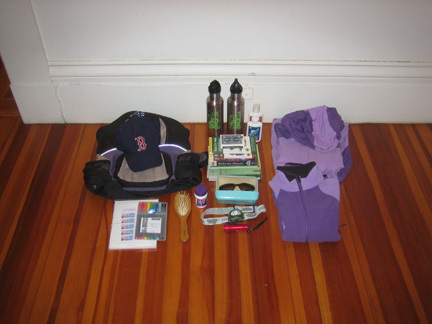 My luggage contains just about every single item recommended for a two-week session of camp, listed on the packing list on page 12 of the camp handbook. 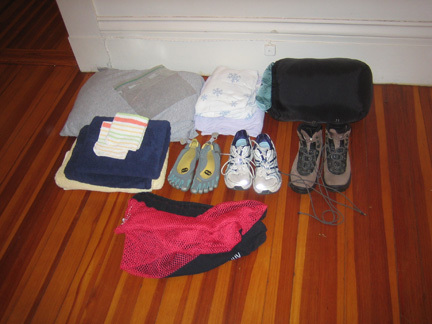 I use my laundry bag to pack bulky items that will be immediately unpacked in my tent or cabin, like sheets and a pillow; a sleeping bag; towels (which store most neatly if I hang them from a rail on the bunk); and shoes (which I’ll line up under the edge of the bed). Once I’ve unpacked, I’ll hang the empty laundry bag from the rail of my bunk. I pack loose small items, such as socks and underwear, in stuff sacks. Large plastic bags also work just fine. For kids who have a hard time keeping track of their stuff, I have seen parents pack clothes for each day in labeled bags or tape each day’s clothes together with masking tape. Sometimes it really helps to have a system! 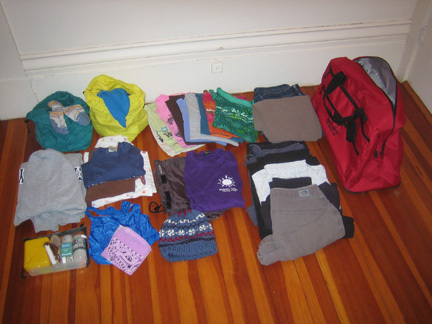 At the end of camp, all the dirty laundry and linens can stay packed in the laundry bag, and all the other items can go into the duffle bag and backpack for the trip home. It took me about 40 minutes to gather all my belongings and pack them into my bags…but I’ve been doing this for many years, so it might take you longer the first time, and you should plan for that. I recommend printing a copy of the packing list. It’s often helpful to collect all your belongings, spread them out on a bed or a table, and check off each item as you pack it. 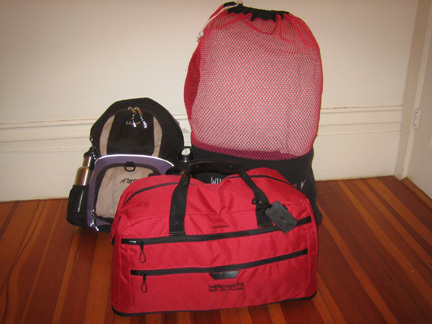 Campers of all ages should help with the packing process so they know what their luggage looks like and how it is packed. Put a copy of the packing checklist in the bag! I would be happy to answer any of your packing questions! This entry was posted in Summer Camp on June 20, 2013 by Heather. Thanks for sharing this Amanda! Very helpful!